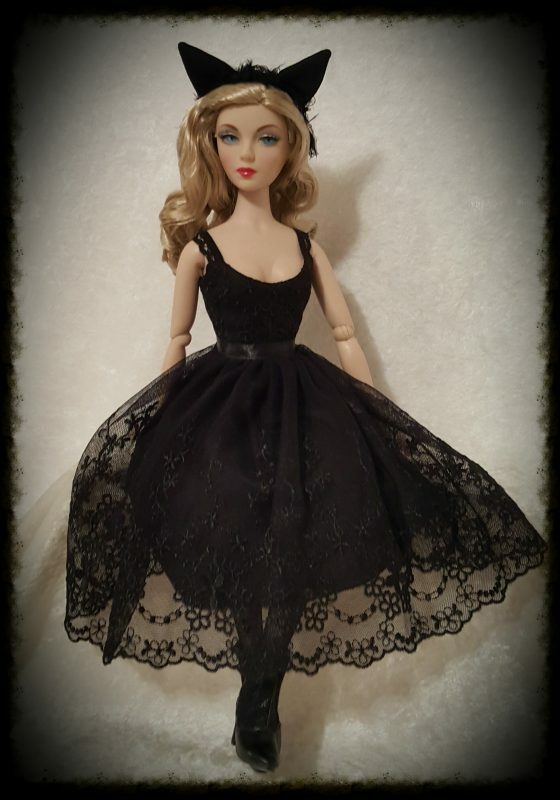 Black Cat embroidered french lace dress, adorned around the waist with a black satin ribbon, the bodice is lined in white and the dress closes in the back with two snap closures. Also included is the adorable black cat ears headband. 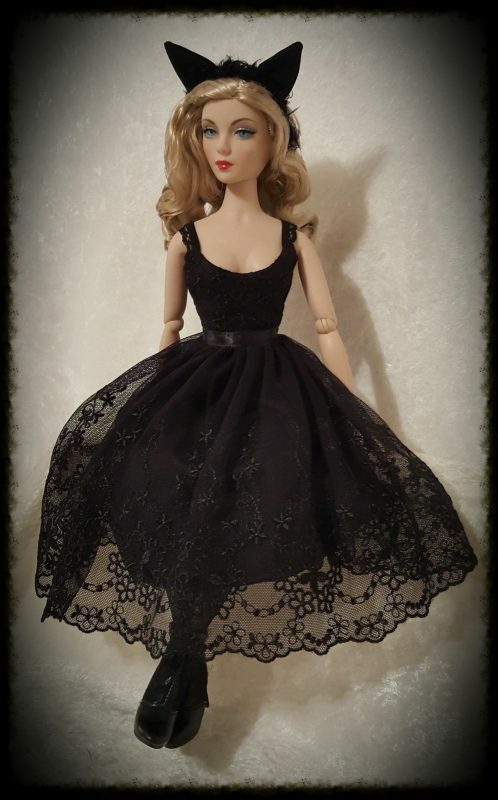 Doll, stockings and shoes are not included. Beyond the blues….gorgeous embroidered lace dress in pale blue, black and silver. 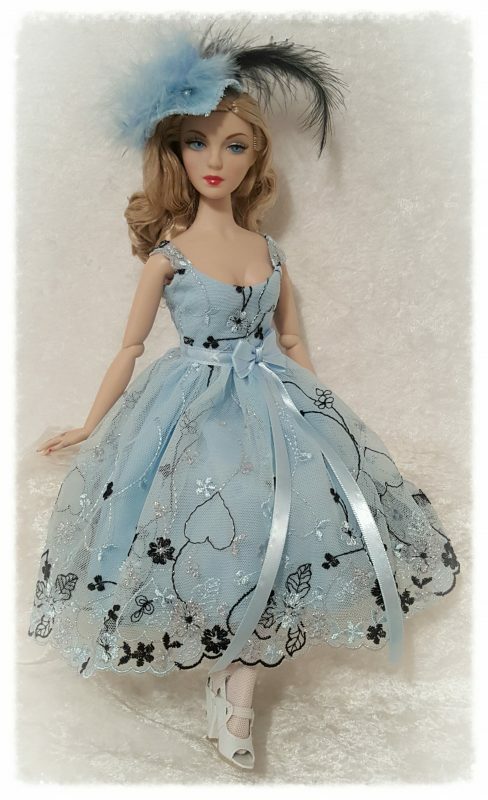 The dress is adorned around the waist with a pale blue satin ribbon and bow. 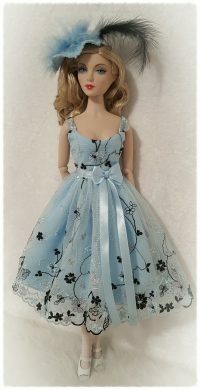 Fully lined in a pale blue cotton fabric, this dress closes in the back with snap closures. Also included is the matching feather hat. Doll shoes and stockings are not included. Those Summer blues. Gorgeous french lace dress with pale blue and ivory embroidery. 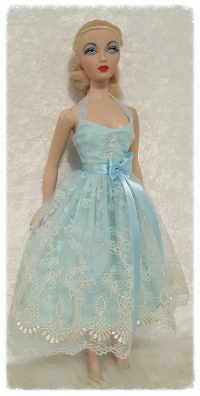 The dress is fully lined in a pale blue bridal cotton and adorned around the waist with a pale blue satin ribbon and bow. 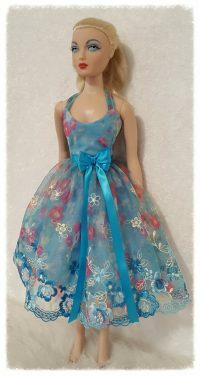 The straps attach behind the dolls neck with a snap closure and the dress also has two snap closures on the back. Doll is not included. 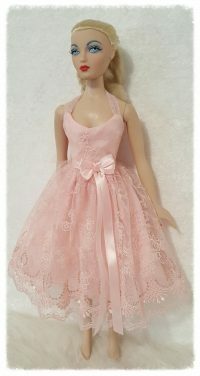 So sweet in pink, this dress is done in a precious pink embroidered french lace, fully lined in a soft pink bridal cotton. The dress is adorned around the waist with a pale pink satin ribbon and bow. 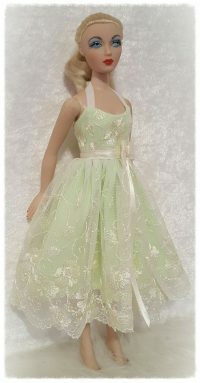 The straps attach behind the dolls neck with a snap closure and the dress also has two snap closures on the back. Doll is not included. 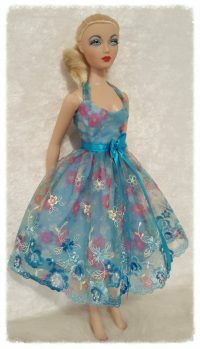 Blue floral summer dress with ivory and turquoise embroidery. 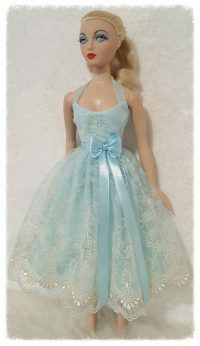 Dress is lined in a pale blue bridal cotton and adorned around the waist with a turquoise satin ribbon and bow. 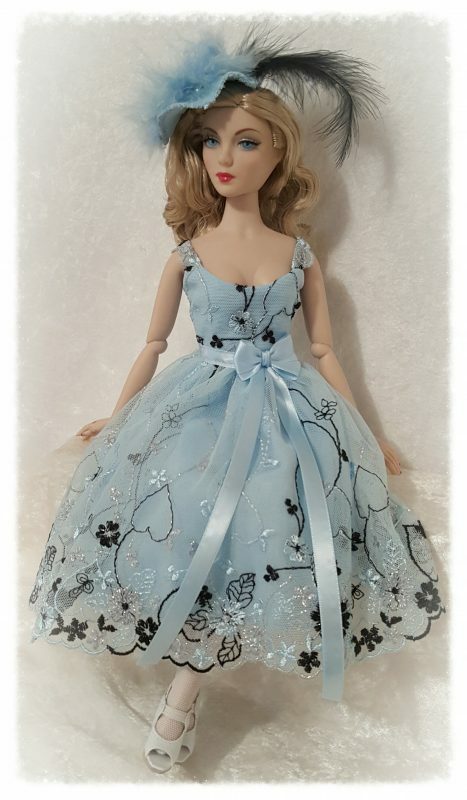 The straps attach behind the dolls neck with a snap closure and the dress has two snap closures on the back. Doll is not included. 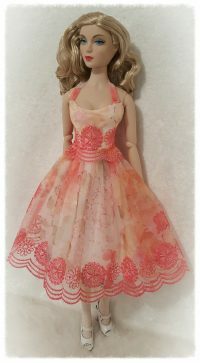 This elegant little fall dress was created with a floral print embroidered lace in shades of ivory, green, salmon and brown. 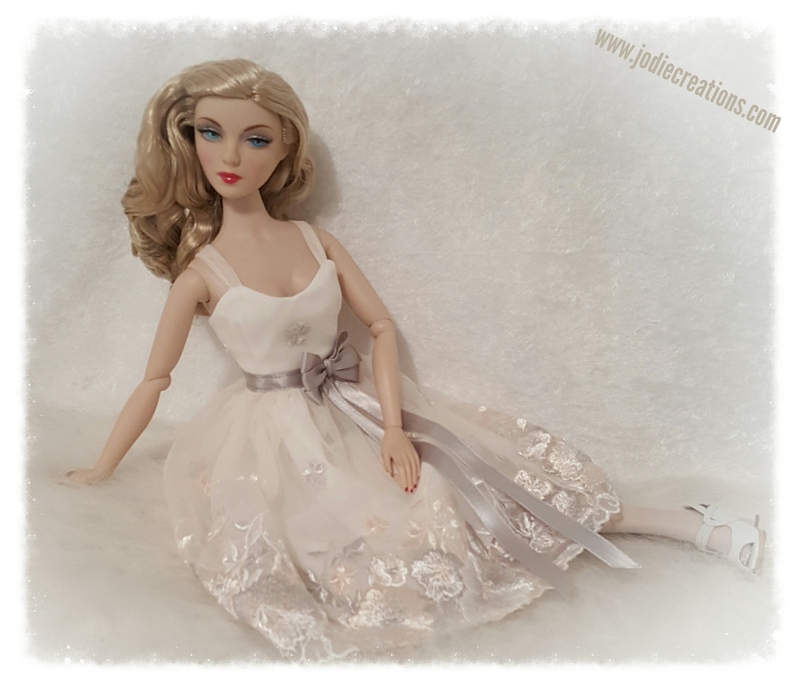 The dress is fully lined in a white bridal cotton, the straps attach behind the dolls neck with a snap closure and closes in the back with two snap closures. Doll, stockings and shoes are not included. 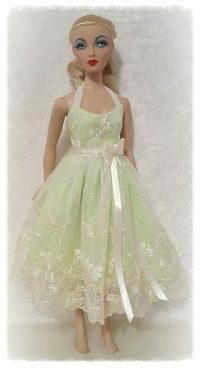 This spring beauty was created using an off white embroidered french lace in ivory and pale green. 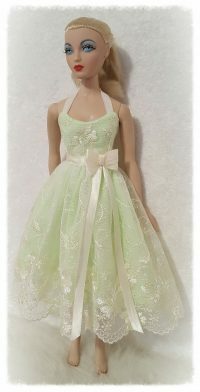 The waist is adorned with an ivory satin ribbon and bow and the dress is fully lined in a gathered pale green cotton fabric for added fullness, the straps attach behind the dolls head with a snap closure and the dress also has two snap closures on the back. Doll is not included. 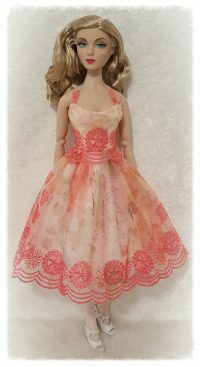 This unique lace is a very pale peach color with silver, peach and white floral embroidery. 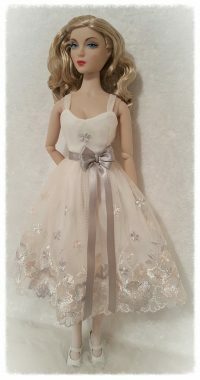 The dress is fully lined in a white bridal cotton and adorned around the waist with a silver gray satin ribbon and bow. The dress closes in the back with two snap closures. Doll, stockings and shoes are not included. Black and White and polka dots. 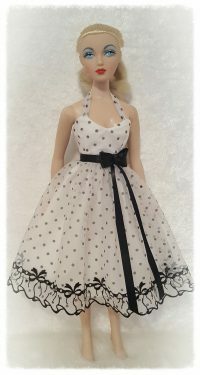 This sweet dress is a perfect fit for your Gene Marshall girl, it was created with a white and black embroidered french lace with black polka dot print. 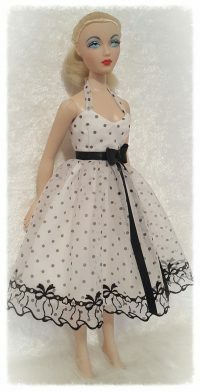 The dress is fully lined in a white cotton fabric and is adorned around the waist with a black satin ribbon and bow. 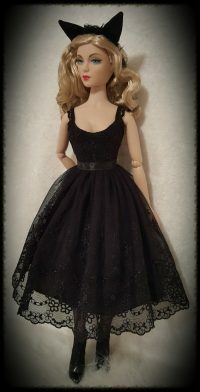 The straps attach behind the dolls neck with a snap closure and the dress closes in the back with two snap closures. Doll is not included. 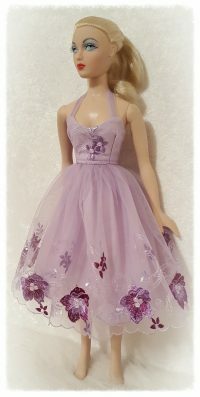 This gorgeous dress was created in a stunning lavender mist tulle lace with purple, lavender and silver metallic embroidery. 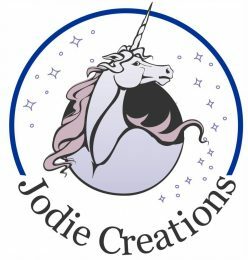 The dress is fully lined in a gathered lavender cotton fabric for added fullness and closes in the back with two snap closures. 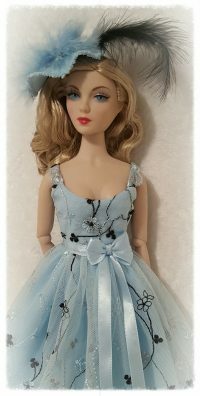 The straps were created from the same tulle lace and attach behind the dolls neck with a snap closure. Doll is not included. 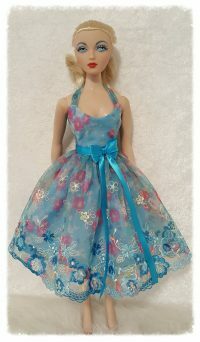 Click HERE to see my past Creations for Gene Marshall.